Discussion in 'Misc. Comics Films' started by monkeygust, Nov 6, 2005. If you hang out at the CBR boards then you've known this news since early this year, but Chud just "broke" it to the world on their site. 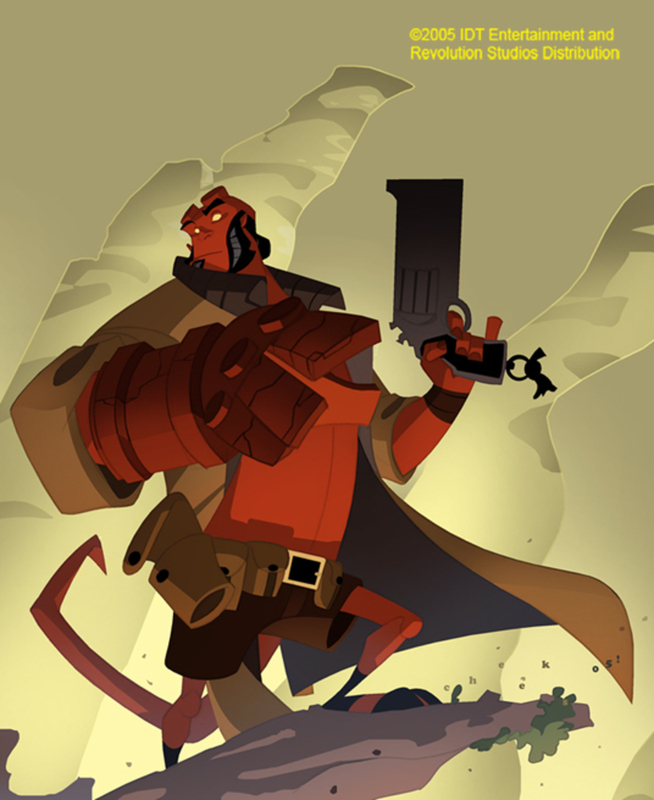 Hellboy animated mini-series is happening. It's sponsored by Cartoon Network and will be in the style of Teen Titans (sort of). It's going to be 70min episodes and will air around Halloween of 2006. It will also be released on DVD later so, for those not living in the US you'll still be able to get your hands on it down the line. What hasn't been said that I can mention is that one of the writers/producers on this new series was heavily involved with successful animated films from Disney and was trained in the old school Disney animation ways so, the story and animation are in very good hands. Also of interest is that both Guillermo DelToro and Mike Mignola know this individual personally so, I'm sure either will be accessible for consultation when needed, to make sure the story is at least faithful to the comics. So, head over to the artist's portfolio page to see what the art will look like. Not bad, even if it isn't Mignola. I think that Sean "Cheeks" Galloway's designs are excellent, even if it isn't in a Mignola style. The designs will translate well into animaton. Now I want to hear the voice actors. At first I was a little taken back by the style, but the more I look at it, the more I think you're right that it will translate into animation really well. We could hear casting news sometime this week. I'd like to see Ron Perlman do it personally. He isn't opposed to doing animated voice work. He's done plenty before. Well there you go. Hellboy will be voiced by Ron and Selma will reprise her duties as Liz Sherman. Doug Jones was my hope for the voice of Abe, but sadly that was not to be. It's not been announced officially who that is, but I'll look into it. Abe is definately in the toon. Lobster Johnson should also be in an episode or too, as well. I'll try to confirm that too. Why would you want Doug for Abe? Doug was only the body in the movie, Abe's voice was David Hyde Pierce. Doug really wanted to do the voice work for Abe and he infact did do some work prior to David, but GDT ultimately went with David Hyde-Pierce. Doug did a solid job, but DHP was the more experienced voice actor so, he edged him out in the end. Other than Ron as Hellboy, I think all the other characters could easily be replaced voice-wise. For those who still manage to come by the Hellboy boards, Here's the blog site for the Hellboy animated projects. I'm a little disappointed that the design is so saturday morning cartoony-ish, but the design in and of itself is pretty cool. Some of the notes about the background work were interesting, as are the notes for the animators that are on Mignola's original panels. ONLY the body of Abe in HELLBOY? Well goodness me, those 3 1/2 months sitting having 8-hours'-worth of makeup applied and then doing a 12-hour day on-set, creating one of the most fluid and graceful characters seen on screen count for nothing against a week or so of DHP in a comfy ADR session providing a voice. David, bless his heart, even refused a credit because he said Abe was Doug's creation entirely. Anyway, I for one am delighted that Doug IS voicing Abe in the new HELLBOY animated project. And long may it continue. I like it. It's a good compromise between the very fish-like Abe Sapien of the movie and the more human-ish Abe from the original comic. That's not really up to them. Very rarely, pretty much next to never do the actors from movie voice their cartoon counterparts. Their schedules usually wouldn't allow for it nor would a show or animated project be able to pay them what they're used to. Even though Pierce is nowhere near what's considered an A-List actor, it shouldn't come as a surprise to anyone that he isn't doing the voice. If this was another live action movie, obviously I'd want Doug back in the suit, with David just doing the voice. But this is animated! It's all voice! They replaced Doug with David in the movie because his voice simply worked better. BUT ISN'T RON AND SELMA VOICING THE CARTOON? David bieng Niles from *Frasier* right? I keep forgetting to look into that. Yeah, the animated films should be a blast. Looking foward to Marvels "Avengers" & the new TMNT films too. This new animated series is looking good. This could help boost Hellboy 2's ticket sales at the box office when it comes out. What do you think? With it being shown on Cartoon Network (right?) it very may well do that. Erm ... nooooo ... the studios went with David because he was better known than Doug AND Guillermo had always heard David's voice in his head when he thought of Movie Abe. During the ADR sessions it was down to Doug and David, and both were brilliant - but the suits decided on DHP because he was better known. Anyway, I'm tickled for Doug as he worked hard on Abe and he's a very talented actor - he deserves this. And he'll do a GREAT job. Oh, and yes, Ron and Selma are both doing their characters' voices in both movies. Yes, however that's the exception, not the rule. We should consider ourselves lucky that the're able to do it. Actually, it's not surprising that Ron is doing the voice as he he does alot of voicework for cartoons and animated movies. You should still consider yourself lucky though. I Just Wonder What The Are Going To Call The Show.